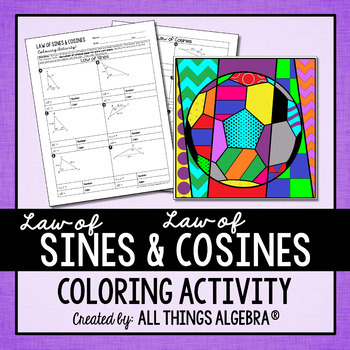 This coloring activity was created to help students find missing side and angle measures in triangles using the Law of Sines and Law of Cosines. There are 12 problems total, 6 Law of Sines problems and 6 Law of Cosines problems. 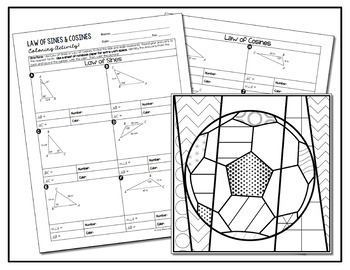 For each problem, students missing side and angle measures, which will reveal a color with a number so students can color the soccer ball. LICENSING TERMS: This purchase includes a license for one teacher only for personal use in their classroom. Licenses are non-transferable, meaning they can not be passed from one teacher to another. No part of this resource is to be shared with colleagues or used by an entire grade level, school, or district without purchasing the proper number of licenses. If you are a coach, principal, or district interested in transferable licenses to accommodate yearly staff changes, please contact me for a quote at allthingsalgebra@gmail.com. COPYRIGHT TERMS: This resource may not be uploaded to the internet in any form, including classroom/personal websites or network drives, unless the site is password protected and can only be accessed by students.